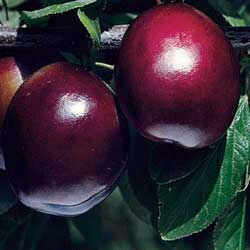 Plums were developed from the South, where they are found growing wild in thickets. Most Americans have eaten native plums found growing along fence rows and the edge of the woods, but hybrid plums are sweeter and much larger than the native plums. 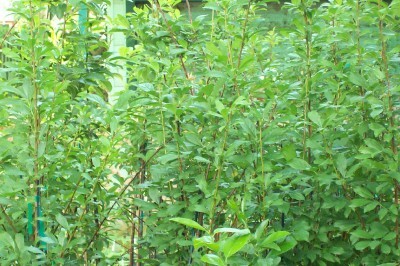 Hybrid plums will grow from Gainesville, Florida to Richmond, Virginia, and then to the West. Plant more than one tree for good pollination, and also stagger their ripening dates for a continuous harvest. In good soil and with proper care (rabbit protection, mulching, and attention to pest problems) plum trees will bear fruit in 3-5 years. Methley - Excellent quality and a handsome appearance. This early variety has red-purple skin and soft, juicy, blood-red flesh. Burbank - Large, bright red-purple. Hardy, valuable for canning and roadside markets. The amber flesh is juicy and firm.